Today, many African Grey parrots are hand-reared by breeders for the pet trade, and they can make wonderful and very affectionate companion parrots; however, the methods used to produce the birds for the pet trade greatly affects their behavior and “pet quality” once the birds are mature at 2 to 4 years old. The hand-rearing process deprives the birds of parental interactions, which results in the birds becoming imprinted on humans at maturity. This is done primarily to produce tamer birds, as they learn how to interact with other animals from their parents’ behavior, and the often untamed breeder birds may pass down a fear of humans. The degree to which a bird was hand reared may vary depending on the breeder’s method – some are hand-reared from the point of (artificial) incubation, while others may be left with their parents for a few weeks. The degree to which a bird has been deprived of its natural parents can adversely affect its behaviour once it is an adult; birds which have been raised at least partially by natural parents tend to show fewer behavioural problems (such as plucking or fearfulness) upon maturity (Schmid et al 2005), though birds raised entirely by their parents may be less tame. Some breeders may hand rear babies in the presence of tame adult pet Greys that may serve as role models for the babies. Also to be considered is how a baby grey is weaned and fledged. A baby Grey should be abundance-weaned (allowed to wean at its own pace) and be allowed to learn to fly. Force-weaning and clipping a baby before it learns to fly are believed to occasionally cause development of fearful behaviors when the young grey reaches several years of age. 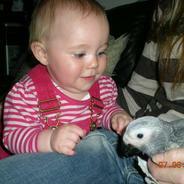 Some grey parrots may not be compatible with small children. 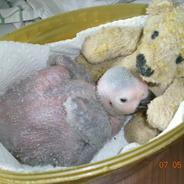 African Grey parrots are very strong and can inflict serious wounds on human flesh with their powerful beaks. Their nails are naturally sharp and can scratch, though the birds do not use them aggressively. Pet owners often liken the experience of keeping an African Grey to that of raising a young child – not only because of the birds’ intelligence, but also from the substantial time commitment required. While captive-bred birds usually assimilate into their new households with relative ease, wild-caught African Grey parrots (which are no longer legally available in the US or EU) can find it difficult or impossible to adapt to life in a cage as a pet. They may show great fear of humans, emit a growling sound as a fear response, and may panic when approached. Unlike more common pets, African Grey parrots have not been greatly “modified” by selective breeding; they are only available as wild-type birds. As opposed to the many color varieties available in budgies and Rose-ringed Parakeets, the closest African Grey Parrots get to a color variant are the “Cameroon African Greys” which are a natural variation of the normal wild bird’s colour. African Grey parrots, like most pet parrots, are considered by many[who?] to be very high-maintenance pets, as they require a good deal of personal attention and many hours each day out of their cages. While numbers vary with each source, most[who?] agree that three hours out of cage daily and 45 minutes of physical interaction is the minimum attention required for good mental health. African Greys, particularly Congo African Greys, are known to be wary of strangers, and tend to bond solely with their main carer if they do not interact with different people regularly. While interspecies friendships with other parrots are uncommon, as African Greys are essentially social animals, they will benefit from being kept in the company of other birds. Juvenile Congo African Grey Parrot. Irises are dark grey.Grey parrots are prone to behavioral problems if they are not provided with a stimulating environment and allowed plenty of time out of their cage each day. They should be given a range of regularly changed toys to keep them occupied, including destructible ones made from natural materials such as cardboard, wood, or natural fibers. Toys should also include “puzzle toys” or “foraging toys,” which hold food treats that the bird must learn how to extract from the toy. Boredom and overuse of the cage can typically lead to problems such as self-plucking, where the bird damages or removes its own feathers. Many Greys are traditionally kept in cages too small to allow the bird to fly, and occasionally for young, clumsy or very nervous Greys (often Greys that have been clipped at a young age), a smaller cage may indeed be necessary for a time to avoid the bird from falling and injuring itself or becoming frightened. However, most Greys will benefit greatly from a large cage which allows more space for different perches, toys, and exercise. Provided the bird spends several hours each day out of the cage, interacting with its caretaker and/or other birds and people, a cage which is 4 feet long by 3 feet deep and 3 feet high is adequate. The bar-spacing should be 1/2 inch to 1 inch. The height of a cage is typically not important, except in the case of playtop cages that are taller than the owner, in which case the bird may show some aggressive behaviours. Grey parrots kept as companion animals should have access to a range of other places within the room in which they are kept, including a playstand holding a range of perches and further toys. A companion African Grey should be kept in a bird-safe environment and placed in a fairly ‘busy’ part of the home, such as the living room, to allow the bird to be occupied with observing the household activities. However, the cage should always have a solid back or be placed against a solid wall, as this helps to give the bird a feeling of security not otherwise available due to the “goldfish bowl effect” of being in a cage. Grey parrots should be trained to accept some requests or “commands” from their carers, including flight requests; this ensures most birds can fly safely and removes the ‘need’for wing-clipping. Wing clipping is very controversial. Some owners prefer to clip to prevent potentially dangerous indoors flying. However, wing clipped birds are no safer than full-winged birds, but merely subject to different risks as pet birds (Glendell 2007). African Greys are heavy-bodied birds and more prone to clipping-related problems than some other parrots. Clipped birds may crash and injure themselves, often on the sternum. Clipping birds may also damage new “blood” feathers, as these grow down in the moulting process, which can result in painful persistent bleeding. Severely clipped birds may have balance problems and fall often. Preferably, greys should not be clipped at all. If a Grey is clipped, it must be done by someone who understands the moulting sequence of the bird so as to avoid damage to blood feathers when these grow down on a clipped wing during the bird’s moulting period. A clipped Grey should still be able to fly or glide short distances to avoid injury. Birds with clipped or damaged flight feathers can have flight restored immediately by a specialist avian vet imping (splinting) donor feathers back onto the bird’s clipped feathers.